Though adults tend to look back on youth as a time of innocence, childhood is actually terrifying. Kids are always privy to more of the world’s horrors than we realize, and those glimpses of war on the evening news or the mutilation on display in anti-drunk-driving films leave permanent scars on their permeable little minds. We recently spoke with Littler about the real-world inspiration for Scarfolk and what we can learn from its language of fear. 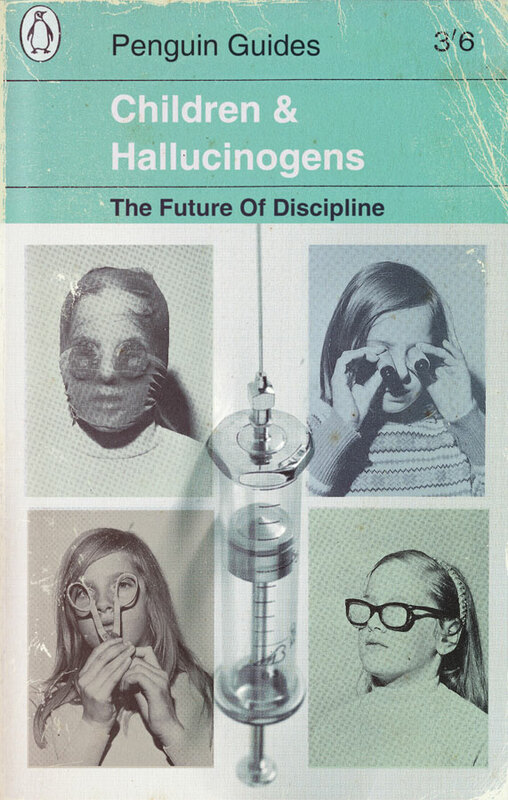 Top: The cover of a mock-Penguin book on children and hallucinogens. 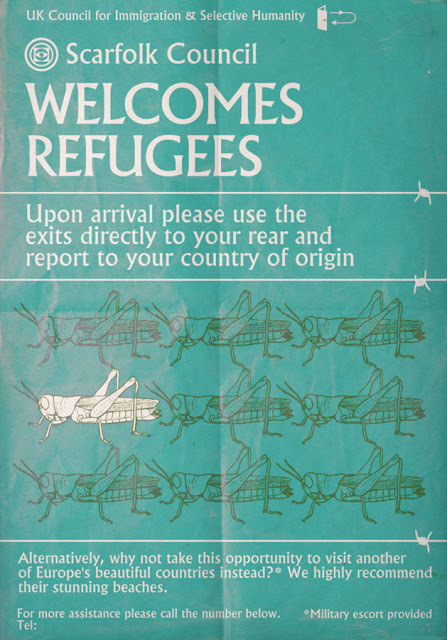 Above: A page from an outdated Scarfolk tourism brochure. Collectors Weekly: Where did the concept of Scarfolk come from? Richard Littler: I initially started Scarfolk because I wanted to capture, or rather investigate, the fading memories of my 1970s and early ’80s British childhood. I suffered from night terrors as a kid, and looking back, I often couldn’t distinguish between what was real and what had been a vivid nightmare. One such memory was of children playing school sports on a railway line: As the children entered a dark tunnel, they’re injured or killed by speeding trains while a brass band played on the embankment. It almost sounds like the plot of a Bunuel film, and for many years I was convinced I had imagined it, especially because everyone I mentioned it to looked at me as if I were insane. A few years ago, I finally discovered that I hadn’t imagined it—it’s a 1977 public information film called “The Finishing Line,” which was made to deter children from playing near railway lines. The film was screened at my junior school, or around second or third grade in the U.S., where pupils were also shown slide presentations of burn victims to discourage playing with fireworks. “The Finishing Line” caused controversy at the time and was eventually withdrawn. However, its replacement was another violent public information film about a boy called Robbie who loses both legs in a railway accident. 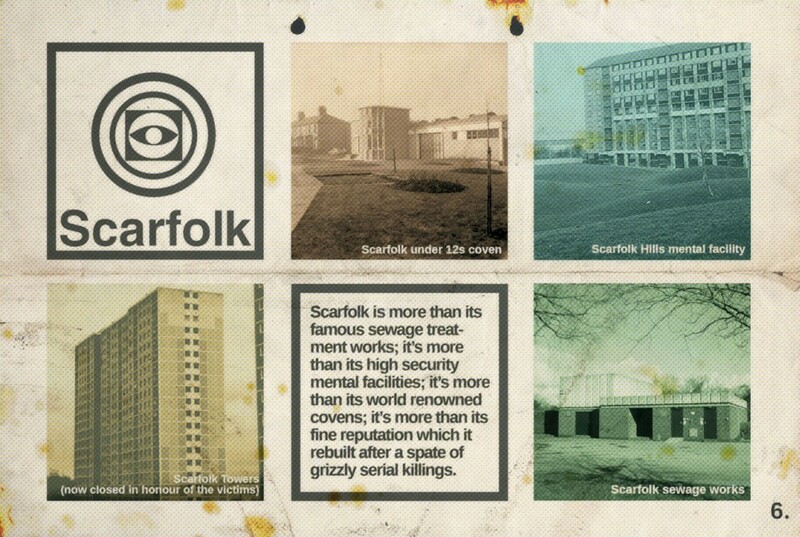 In terms of external inspirations, Scarfolk has all sorts of influences, including Monty Python and Terry Gilliam in particular, George Orwell’s and Yevgeny Zamyatin’s dystopias, the political cartoonists Gerald Scarfe and Ralph Steadman, music by Boards of Canada and The Beatles (whose work from 1967 on I consider “proto-hauntology”), and even the surreal song introductions during live Peter-Gabriel-era Genesis shows. 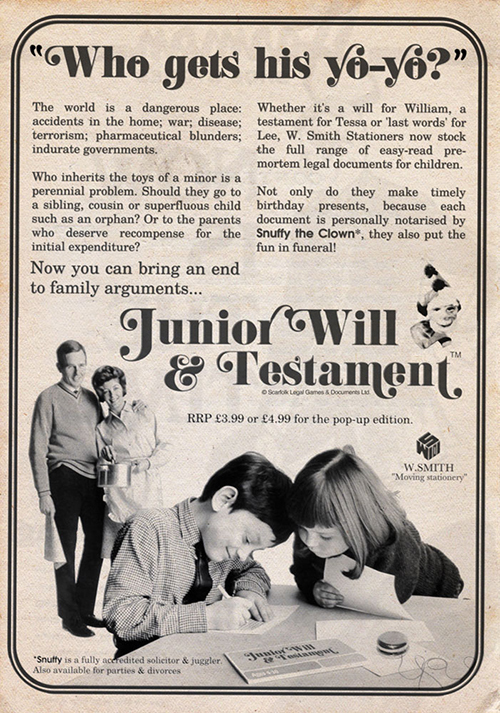 The conceit is that Scarfolk can never leave the 1970s, even though the rest of the world passes by normally. Perhaps this happens in a neighboring parallel universe, who knows. In practical terms, it means the present day can occasionally leak into the 1970s and vice versa, which is a way to contrast changes in social attitudes and ideas of the past 40 or 50 years. 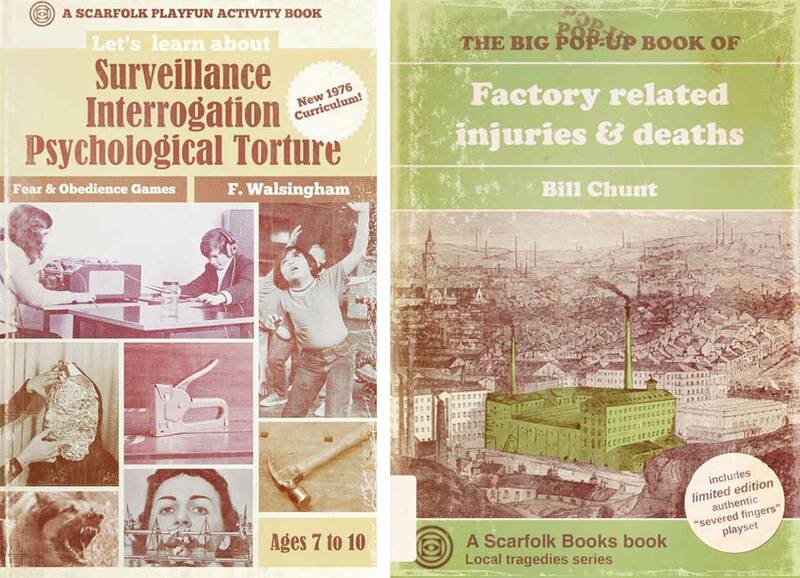 Two Scarfolk books aimed at children. 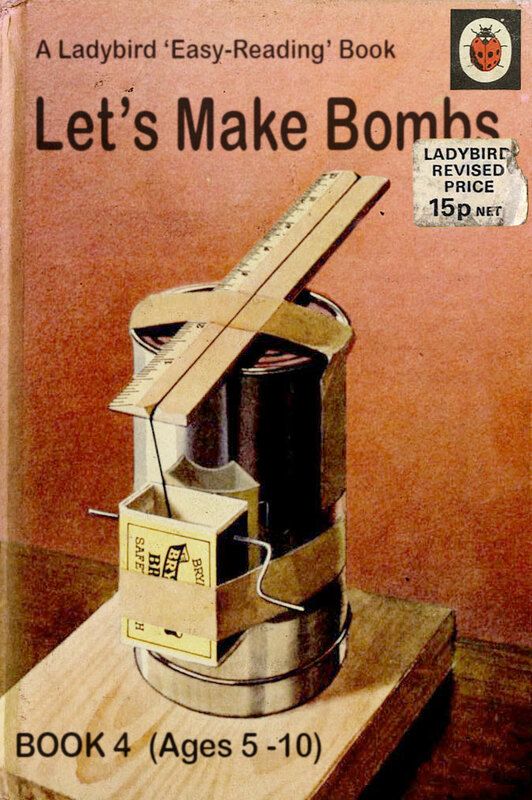 Collectors Weekly: Do you think of Scarfolk as an alternate version of your childhood? Littler: Scarfolk is more like a half memory. This means popular or stereotypical imagery from the period is ignored—there are no lava lamps, discos, or garish fashion and interior design. Scarfolk often invokes involuntary memories of long-since forgotten things, which didn’t have a life outside of the period or were taken for granted, like municipal designs, household products, TV station idents, and library music. The vaguer the memory the better, because it produces this dim sense of recognition, and as you try to piece together the fragments, Scarfolk offers a substitute history. These substitutions are fictional, of course, and sometimes absurdly dark and dystopian. 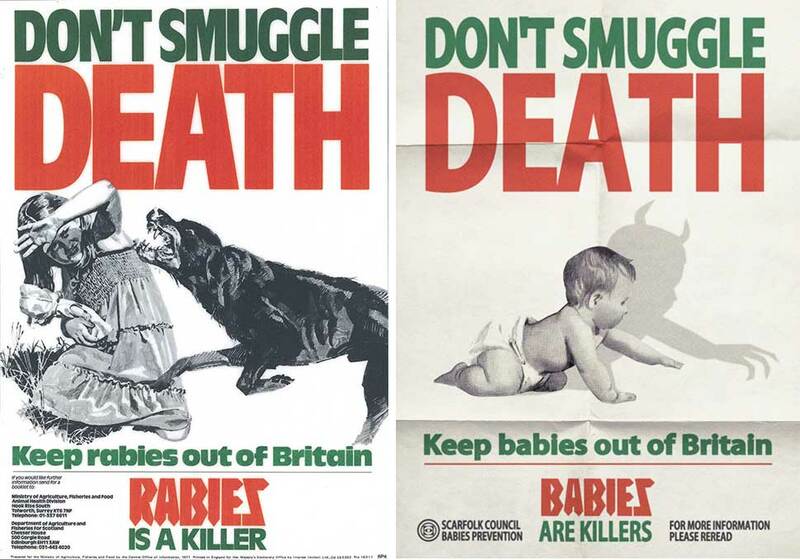 This 1977 anti-rabies poster (left) inspired Littler’s Scarfolk design (right) warning about the dangers of babies. Collectors Weekly: Were the ’70s really so dystopian? 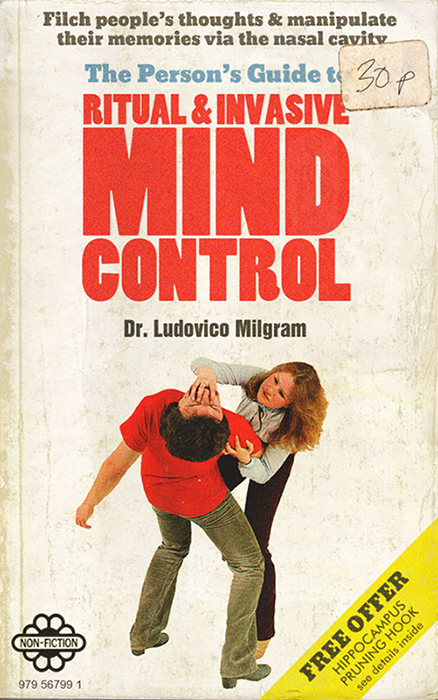 Scarfolk graphics, like the above book cover, push actual issues toward laughable conclusions. Littler: I don’t know how much of my memories are colored by hindsight, but it certainly seems dark in retrospect. Sometimes it was quite literally dark, as well: I grew up during a time of industrial unrest when the country was subject to power cuts and rationing. There were frequent reports of riots and IRA terrorism in the U.K., some of them relatively close to home. I think that such random events undermine one’s sense of security. This lack of control also affected another area of culture, the preoccupation with the supernatural and occult. Books about UFOs, ghosts, telekinesis, and witchcraft filled the shelves. There wasn’t any skepticism as far I could tell. It was all delivered as fact; perhaps it was a more gullible time. It was as if the fabric of reality was unstable and a poltergeist or UFO could appear at any time. The term most often applied to Scarfolk is hauntology, which I hadn’t heard of before I started Scarfolk. Hauntology plays in part with the idea developed by Jacques Derrida (via Karl Marx) of the specter of communism haunting Europe after its demise, but it has become something a bit different in popular culture. It recycles aesthetic forms and reflects the clash between the dreams we had of the future in the 1960s through the 1980s versus where we actually are now. But it also looks back, as did 1970s culture, to earlier periods, like pre-Christian paganism and Victoriana, for example. Collectors Weekly: As a designer, what do you like most about the period’s aesthetic? Littler: I like the clean lines and simple typefaces of modernism, and I’ve come to appreciate the aesthetic of Brutalist architecture. But it’s not just the period design I’m drawn to—I’m also interested in the pre-digital age and the idea that everything from that period is physically decaying. Digital images don’t fade after being left on a window sill for a few years; they don’t crack or crumble. An image that goes viral on the Internet, for example, is identical no matter how many copies there are of it. In the pre-digital age, two people may have owned the same book or LP, but there would be idiosyncratic differences between the two physical objects. I have a personal response to most of the artifacts I imitate, and I’m lucky that others have had similar responses. Two of the album covers Littler produced for Scarfolk. 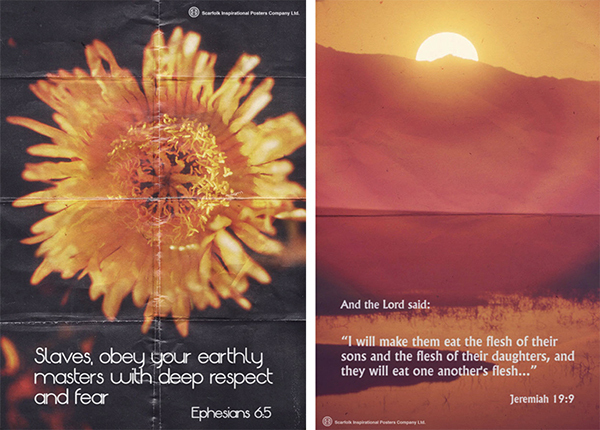 Collectors Weekly: What’s your typical method for creating Scarfolk graphics? Littler: I have a couple approaches. The first is to scour the Internet or my own books for an image that appeals to me and then improvise an idea around it. I collect digital imagery of the period for reference—my folder of 1970s images has about 20,000 items in it. In terms of physical objects, I don’t actively collect anything, though I own many publications from the period, particularly comics and books. The second method is to start with an idea, and then go hunting for the appropriate imagery. This is a much harder process, but it’s necessary for posts that are direct comments on contemporary events and recent news. 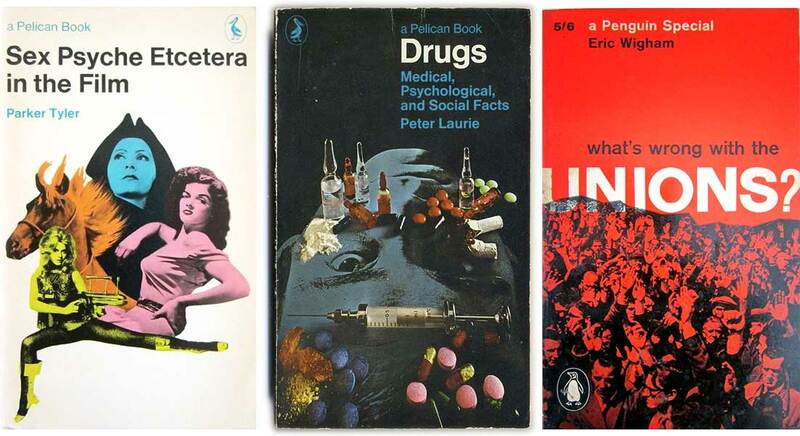 Scarfolk designs often play with the modernist aesthetic of actual Penguin covers, like these three above. Collectors Weekly: Have people mistaken your designs for real artifacts? Littler: I’ve had mails from people telling me they contacted Penguin, the publisher, to ask where they might buy copies of some of the fake Scarfolk books, like “Children and Hallucinogens.” And there are often cases when people believe a Scarfolk post to be genuine, particularly those posts which elicit knee-jerk emotional reactions. Usually these deal with social issues like race, gender, or the treatment of children, and they haven’t taken in enough of the image to realize that it’s parody or satire. 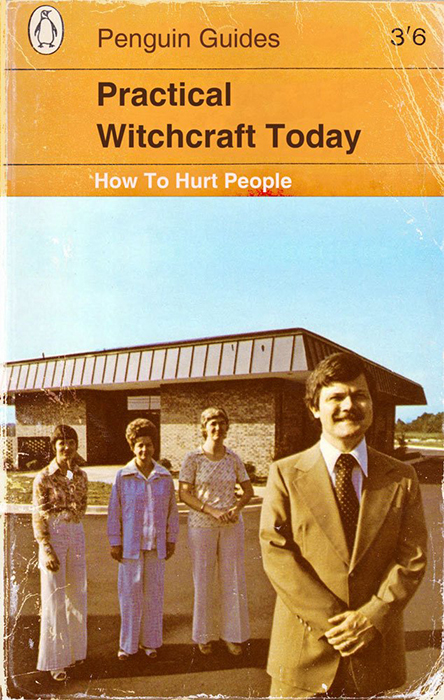 Most Scarfolk readers are very playful and like to string people along for as long as they can get away with it. I have a soft spot for “Children & Hallucinogens” and “Don’t” because they propelled Scarfolk when I first started the blog, and to date they’re two of the most frequently viewed images. In general, I prefer designs that imitate recognizable period branding, like the Ladybird or Penguin book covers. 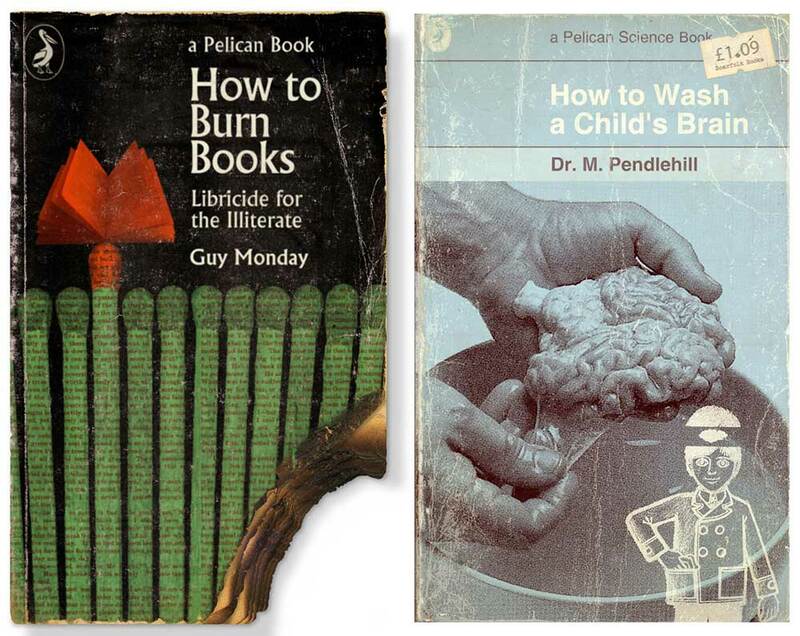 Two of the unsettling “How To” books made for Scarfolk. Collectors Weekly: How does Scarfolk reflect contemporary culture? Littler: Scarfolk is paranoid and cynical, and often touches on themes such as surveillance and the diminishment of civil rights. To a certain extent, Scarfolk is speculative because it plays with the recent political developments and either subverts them or exaggerates them to the point of absurdity, though that’s becoming difficult with people like Donald Trump and the incumbent British government. Increasingly, there are official actions and statements that come across like they’ve already been created by satirists. It’s becoming hard for us to outdo our sources! Some Scarfolk graphics are particularly disturbing because of their realism. 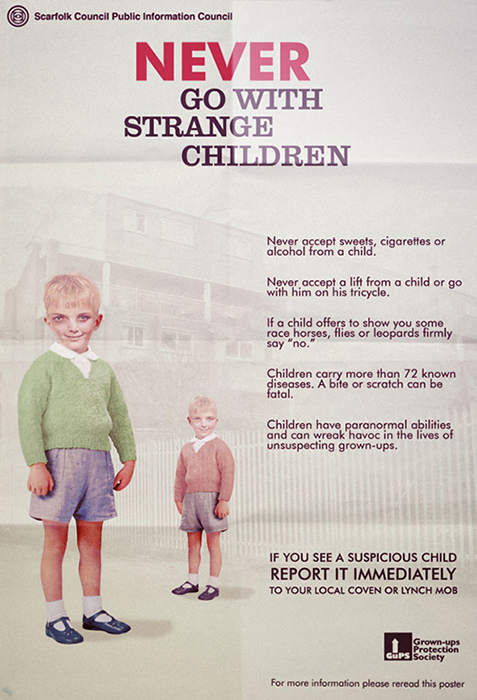 Scarfolk posters like the one above play upon 1970s-era fears that are still being stoked today. Others derive humor from the absurd. Littler ensures every detail reads as authentic, down to a vintage price tag. This "Pollute" game box riffs on classic "Jaws" imagery. In Scarfolk, children are criminals rather than victims. In addition to the threats of modernity, Scarfolk's citizens are also obsessed with the paranormal. 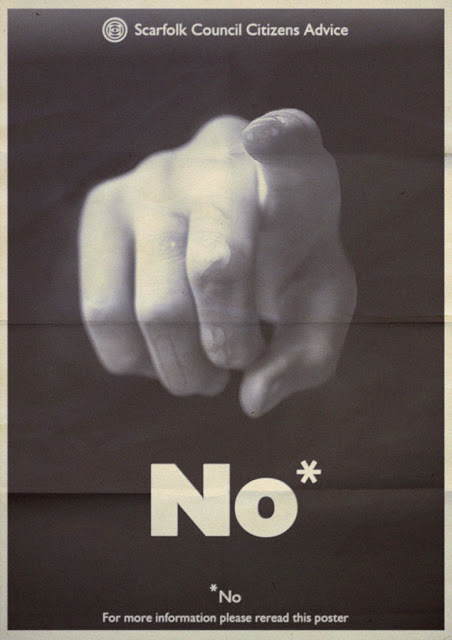 This ominous poster captures the ethos of Scarfolk in a single word.